Oh my! These were pretty amazing. I've had roasted marshmallow ice cream on my mind for a few years now, as it's one of the more popular flavours at Greg's Ice Cream in Toronto. I don't live in Toronto any more, but I always go to Greg's when I'm in town. Their sweet cream ice cream is my favourite--it's like vanilla without the vanilla. Cardamom is another fave, though both these seemed like they'd be fairly easy to reproduce. The roasted marshmallow, on the other hand, is the subject of much speculation on Toronto food sites. I had to experiment. When I made the Baked Alaska I noticed the toasted Italian meringue tasted very much like roasted marshmallows. So, I decided to use that, as I was too lazy to make my own marshmallows, and the store-bought ones are a bit scary. The recipe worked out nicely, as the custard used the egg yolks and the meringue the whites. I took the sugar from the custard and used that in the meringue so the ice cream wouldn't be too sweet. Can ice cream be too sweet? The labour intensive part of this recipe was the browning of the meringue 'marshmallows'. I put tablespoon-sized blobs on a baking sheet and used my torch, but next time I might spread the meringue thinly and broil it. The more browned bits, the better. I added the browned meringue to the hot custard and whisked to blend. I decided not to use the blender, as I liked the tiny dark specks. The meringue didn't totally deflate, making this ice cream seem light. Combine ⅔ cup of sugar and ¼ cup water in a small saucepan. Stir until sugar dissolves, then heat, without boiling, until the syrup reaches 236-244℉. While you are doing this, heat milk and cream to near boiling. Whisk eggs yolks and 3 tablespoons sugar together till thick and pale. Whisk hot milk/cream mixture in and return to pot. Stir constantly over medium-low heat until mixture thickens and coats the back of the spatula. Keep an eye on the syrup! If you are not comfortable doing all this at once, make the custard first, and cover the pot while you complete the meringue. When the syrup is at about 230℉, start whipping the egg whites and cream of tartar. When they reach soft peaks, add the remaining sugar and whip till stiff peaks form. Still whipping, add the hot syrup in a thin stream and beat till cool. Blob this mixture on a baking sheet, or spread thinly. Broil or use a torch and brown well. Whisk into hot custard, then chill thoroughly. When chilled and ready to churn, whisk again, adding vanilla and rum. The rum is to prevent it from freezing to hard. Churn in an ice cream maker and then transfer to a freezer-safe container to firm up. If you want to make ice cream sandwiches, put ice cream into a parchment lined 9"x13" pan to a depth of 1" or so. Freeze. In an electric mixer, beat the butter and sugar on medium speed until fluffy, about 2-3 minutes. Lower the speed and add the eggs, one at a time, beating well after each addition. Add the vanilla extract. In a separate medium bowl, combine the cocoa powder, the flour, baking powder, and salt. Still with the mixer on low speed, at the dry ingredients to the butter mixture and mix until the dough starts to come together. Gather the dough into a ball and refrigerate at least 1 hour. On parchment, roll out the dough to about 1/4-inch thick. Use your preferred cookie cutter to cut out as many pieces as you can, removing extra dough. Slide parchment onto cookie sheet and gather and re-roll the scraps if necessary. Make patterns on cookie with a fork or other tool if desired. Place on lined baking sheet and bake 8 - 10 minutes. 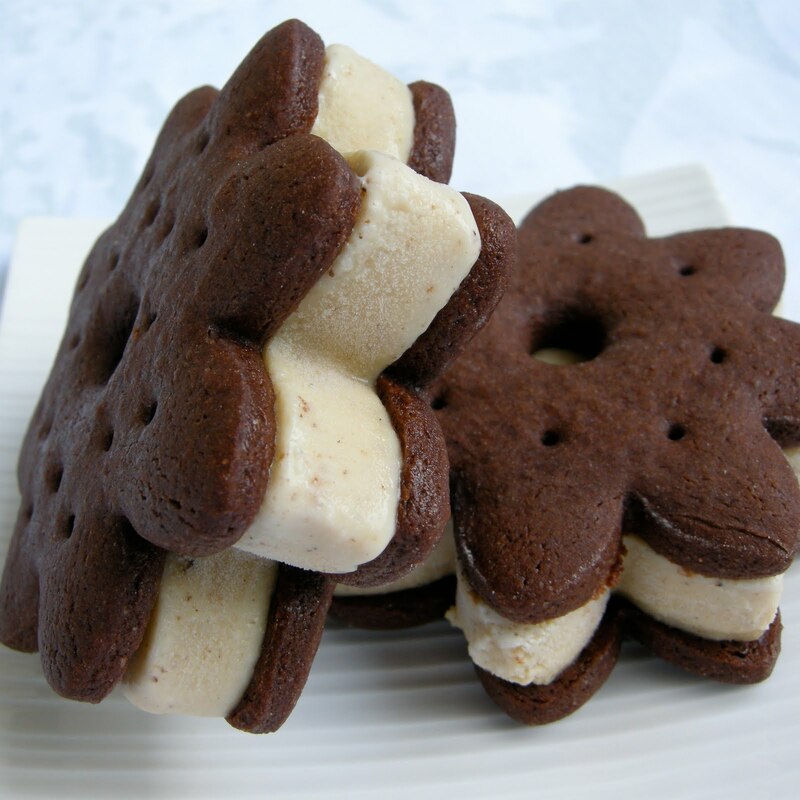 Cool completely before sandwiching them with ice cream. Are you still reading? Try this ice cream! The flavour is mild, but so good. I think these would be amazing with the graham crackers. 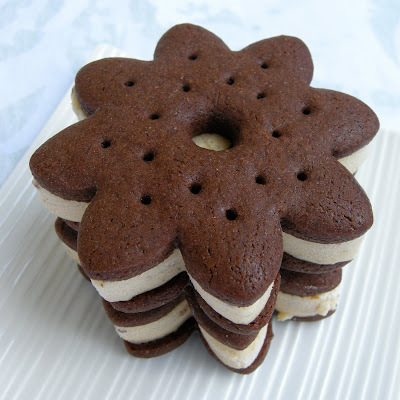 They are my favourite ice cream sandwich cookies, as they soften up a bit more than these chocolate ones. Maybe chocolate dipped, for a s'morewich? Love the way these look! Wow! Chocolate, and marshmallow ice cream...what more does anyone need in life on a hot summer day? OMG - I want these! Marshmallow icecream - what's not to love? 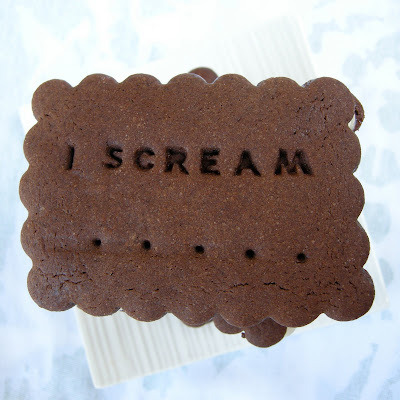 I also love how you stamp your cookies - makes me laugh every time. Oh, they look fantastic Mary! Looks like I'll just have to make these too!! So cute, and the ice cream sounds delicious! When can I go to your house? I read the title and my heart went pitta-patta stop. It's love. LOVE the ice cream and you dusted off you letters baking kit hehe. They look awesome. I have been craving and ice cream sandwich too all summer! Mary where did you find the cute cutters at? These look & sound so delicous, but I can't make these without the cutters! These ice cream sandwiches are just gorgeous! And I've never had this flavour of ice cream, but it sounds decadently good! 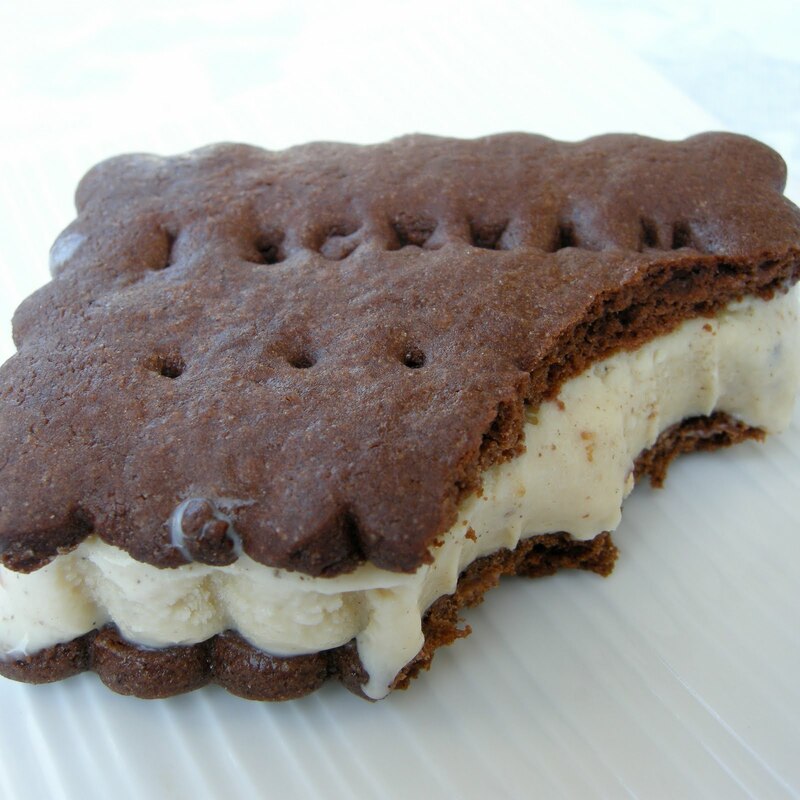 Mary, this ice cream sandwich reminds me of my childhood, when I used to eat a delicious one, very similar to yours. I will definitely try this recipe! It's on my to-do list already! 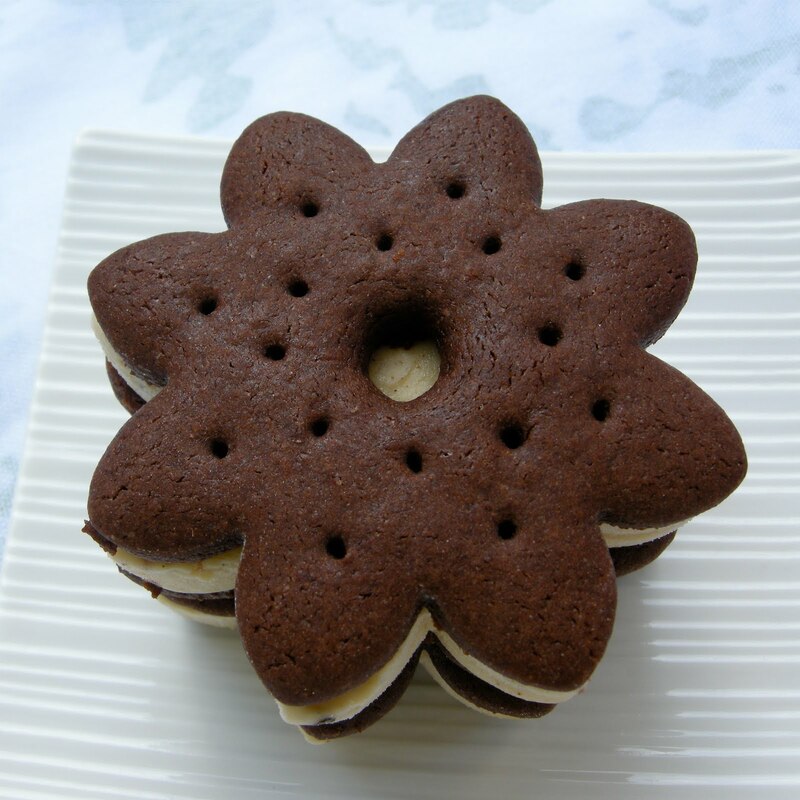 Love your flower shaped cookie! Thanks for sharing! what a fantastic idea! they look so cute and the ice cream sounds delicious! Send one over, immediately. I need a pick me up. These are gorgeous and just the thought of the marshmallow flavor.......sigh. Wow, marshmallow ice cream. Now that I like the sound of, thanks for sharing. Joanne, I got the rectangular ones at Williams-Sonoma, and they are in stock again--they also have Christmas ones. The flower cutter was a gift. What did you use imprinting the words "I scream"? The Daring Bakers get creative! Daring Cooks put things in jars!